STORY: German Foreign Minister Frank-Walter Steinmeier on Tuesday (April 14) called on Indian Prime Minister Narendra Modi, who is in the country on a three-day visit. Modi, who is on a three-nation tour with business high on agenda, also met Chief Executive Officer (CEO) of German multinational financial services company, Allianz, Oliver Baete. 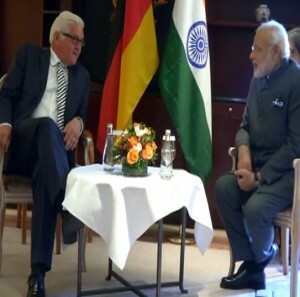 The Indian PM arrived in Berlin on Monday (April 13) afternoon after completing a successful tour to Hanover city where he attended the opening ceremony of the Hannover Messe and invited German companies to invest in India through his pet campaign ‘Maki in India’. The Hannover Messe, officially hosted by India this year, is the world’s largest technology fair. Later in the day, Modi will call on German Chancellor Angela Merkel where they will discuss how tech-giant Germany could work with India in its development agenda. Modi arrived in Germany from France on Sunday morning (April 12), on the second leg of his three-nation tour. He will leave for Canada on Wednesday (April 15) for the final leg of his tour.